When most of the us see the letters "IRS," we tend to get sweaty palms and start to see Form 1040s dancing across the movie screen of our minds. No need to worry with the Orlimar Hybrid IRS -- IRS in this case stands for Iron Replacement System. Orlimar has created a series of hybrid clubs to replace those difficult -- for many -- to hit long irons. For those not familiar with the Orlimar name, the company started in 1959 but didn't break out until 1998 with the introduction of their "Tri-Metal" fairway woods. Though a relatively small company, they gained a nearly cult following for a time -- I know, I was a disciple. Orlimar has long been known to make forgiving, easy to hit clubs, and the Hybrid IRS models are no different. Designed for the golfer who struggles with hitting their long irons, the Hybrid Iron Replacement System clubs are available in a variety of lofts -- from as little as 19 degrees to as much as 56 degrees -- you can actually create the better part of a complete set of irons with these hybrids. Though limited to Right Hand orientation only, the clubs are fitted with the XV graphite shaft that comes in either Regular or Senior flex and covers most of the loft options. A two-piece construction design and internal weighting, combined with an offset hosel, allow the golfer to get the ball airborne more easily and even control the ball flight. 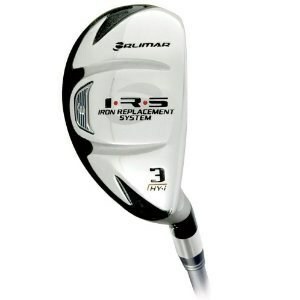 With the Orlimar Hybrid IRS clubs, you're not going to break the bank, either. Orlimar has made a good name in the industry by offering technologically advanced products, for the average player, at a reasonable price.